The best Greek seafood I have had anywhere. My recommendations are Calamari, Greek Salad and I have Sword fish Kebab as appetizers instead of entree. This jewel in the heart of Chinatown in LA got my attention on my recent visit to LA. Authentic Cantonese food served in an authentic Cantonese way. And as a bonus, Rush Hour was shot here ;)..
763 Ninth Avenue, near 51 St.
Go for the empanadas, leave the entrees! This family owned Irish pub is in existence since 1960. I initially went to this place while exploring queens but now I may visit this place more than once a month !. You can always find a place to sit down and relax even on a weekend. Its a kind of a place where friends can meet, talk and have a good time. It doesn't pressure you into a dress code and doesn't have ear-deafening music which is so characteristic of so many places in NY especially on a weekend. The portions of the fries, onion rings and buffalo wings are huge, one of which I always order with my beer. One thing which will catch your eyes is an antique cash register which the owner considers as her good luck piece. Three times and ready to go again.! !.Ambience good, staff knowledgeable, full bar, good cocktails, and the quantity nobody can complaint about. Their Barbecued Spareribs are addictive. I had never tried crispy spinach with a golden curry sauce till I came here. Something unique. The Chow Chow Fun noodles with lobster have lots of basil which makes this dish my favourite. Some people have found the menu very limited. But I think that whatever they serve, is served well. My first encounter with Kati Roll (aka known as Kathi Kabab) was in Delhi at Connaught Place. The place was called Nizam's Kathi Kabab. They served Kathi Kebab which were nothing but rumali roti (an Indian bread) which was cooked in such a way that it had a layer of egg attached to the inner surface and then filled with chicken/mutton/egg/paneer(cheese) with salad and sauce to make it into a roll. It was out of the world. I would visit that place everytime I got a chance. Now in NY, Kathi Kabab or for that matter Kati roll as known here is available at McDougal St. at the Kati Roll company. They are filling and ooze out fresh taste of lamb/chicken and paneer. The difference though is that you have to especially ask for the egg layer and the size of the roll is a bit smaller. But it is still worth it. They also have a branch in Central London at Oxford st.!!. Its amazing that as it gets late in night, it gets busier like the Chicken & Rice place at 53rd St. and Avenues of America. Check this place out and trust me you will visit the place again.! The lunch buffet here is my favourite. Start with Tandoori Chicken, some Pudina Chutney and a chilled Kingfisher premium Indian beer. Nothing like it. Appetizers also include Aloo Tikki with Cholae. When ready for lunch, what could a punjabi ask for more, Butter Chicken (Chicken Makhani), Dal Makhani, Punjabi Curry, Naan and Pulao. They also have Plain and Masala Dosa made fresh in front of your eyes with some hot sambhar. I have always been a big fan of coconut chutney which they don't serve. Last but not the least, the dessert. Kheer it is. The best I have tried in NY. Just as you get out of W 4th St station, cross the 6th Ave to FBPC. Close to Mc Donald's, this place cannot be missed. There is usually a long line to get in but worth the wait. As soon as you enter, you find this place crowded with a lot of young people. The beer is $5.50 even on a weekend is cheap as compared to all the other places where beer is not less than $10 on weekend. Inside, the Morrocan lounge is a nice place to have a small gathereing. Feel like dancing, the "Underground" basement dance floor rocks and the nicest thing is that you don't need to buy a bottle to take a table. Over a period of time the price went for $ 5 to $ 6, but the quantity and quality has never gone down. For all those who come from countries like India and pride themselves with the fact that they can eat very spicy food, believe me this is spicier than what you have ever had. Now a days instead of pouring the sauce onto the rice, this place offers the red as well as the white sauce in small plastic containers. Its now growing and now has one cart which sells soda and water and another one across the 6th Av. on 53rd itself which sells chicken and rice. I have been referring to chicken all the time but they also sell lamb and a mix of lamb and chicken as well. The Gyros are filling too but I still prefer the chicken & rice. Pour 1 cup warm water in a bowl. Add honey and salt to it. Add 1 cup flour and oil to the above. Blend it well and then knead for about 1 min. You can put the dough in a bowl and cover it or can be put in a plastic bag. After 45 mins Punch & Knead the dough. Keep the dough back in the warm place for another 1 hr. After 1 hr punch and knead again. Important: The dough should turn into a ball. If too dry, add water one tablespoon at a time until it does. If mixture is more like a batter, add flour one tablespoon at a time. Today I made Gajar-ka-Halwa, an Indian dessert served during winter times when carrots are easily available. It may not be the most difficult of dessert to make, but the recipe I used may be the easiest available. 1000 gms Carrots: Grate it. 2 Tbsp Ghee (saturated fat). Can also use unsalted butter. Resins, Almonds & Cardamoms: To garnish. Grate the carrots. Heat the ghee/butter in a good size vessel. Add grated carrots to the ghee/butter. On medium heat keep stirring the carrots in ghee/butter taking care that it does not stick (approx 15-20 mins). Once the carrot reduces to half its quantity, add condensed milk and keep stirring for another 15-20 mins. Garnish with resins, almonds and cardamoms. 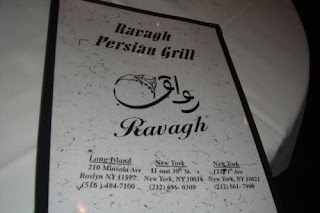 This Christmas eve, my wife and I went to Ravagh Persian Grill. A Persian restaurant which is a crtics' pick on New York Magazine. I started with the very average Persian martini. None of the appetizer had any meat to it. I ordered Salad-e-Olivieh which was a good blend of potatoes, chicken, egg, carrot and mayonnaise. I ordered Sultani Kebob which did remind me of Kebob and rice I used to have when I was in Iran but was nowhere near the quality I was used to. Some of the meat, I thought was not as tender as it should have been. I missed on the Turkish Coffee which the NY Mag so highly recomended. May be next time. On the whole it was an OK place but I do agree that the quantity was enormous and finishing one plate or I may say tray takes some courage. © 2009-2012 mastpunjabi.com. All Rights Reserved. Picture Window theme. Theme images by 4x6. Powered by Blogger.